Every year or so as new ships join the fleet, Carnival shuffles the fleet among home ports, and like dominos falling, the announcements come. For the most part it makes everybody happy, because everybody gets a newer or bigger ship. The changes announced yesterday were started by Carnival Vista joining the fleet. As we noted earlier, Port Miami let it be known that once Carnival Vista arrived in Miami, it was going to stay. Yesterday, Carnival detailed the itineraries it will sail and how Galveston will benefit. 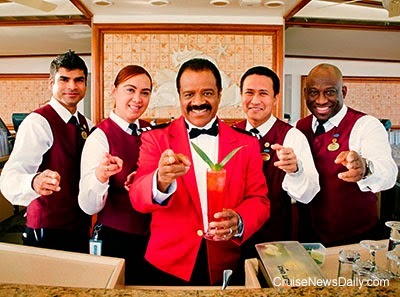 It’s been many years since Isaac Washington served drinks aboard Pacific Princess on the iconic “Love Boat,” but Ted Lange, the actor who brought Isaac to life, and Princess are honoring those memories with a new cocktail available aboard all the line’s ships - The Isaac. When Koningsdam is delivered next year, regular Holland America customers may be confused and think they boarded another line because the dining options have shifted so dramatically to emphasize specialty dining. The spotlight aboard Holland America ships has always seemed to be on the main dining room experience, even though the line has some outstanding alternative dining options. With Koningsdam, however, the main dining room seems to have become one of many, all standing shoulder to shoulder. Princess is The Love Boat, you know. And around Valentine’s Day they get a little crazy, and they come up with some really amusing ideas. This year is no exception, and the residents of Sydney will be the recipients of this valentine. 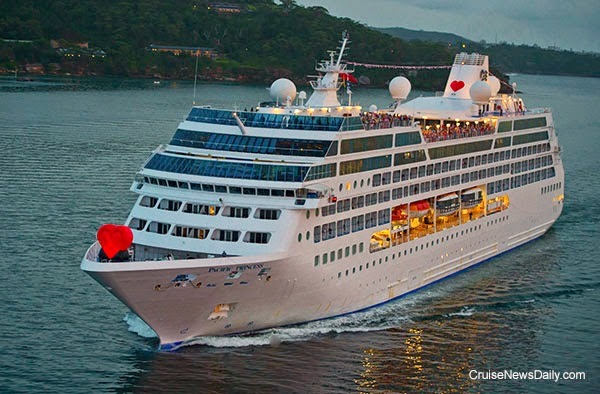 When Pacific Princess arrives in Sydney at 6:30 on Saturday morning, Valentine’s Day, it will be sporting a giant illuminated red heart on its bow. Update February 14: Just arrived: Pacific Princess arrives at Sydney all decked out for Valentine's Day. We placed additional photos on a Pinterest Board. Photo courtesy of James Morgan and Princess Cruises. All rights reserved. May not be copied or used without permission. 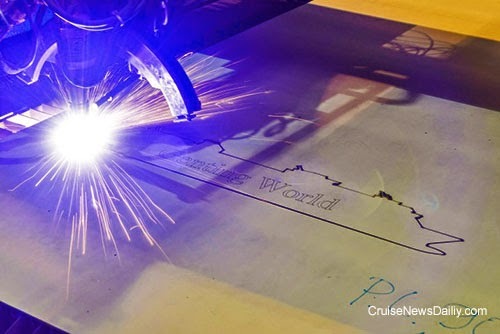 Meyer Werft began cutting steel on Monday for the first of two 151,000-ton vessels vessels ordered by Star Cruises. The first, designated by the yard as S.711, will be named Genting World, and is scheduled for delivery in the fall of 2016. An Italian court found Capt Francesco Schettino guilty of manslaughter and sentenced him to 16 years in prison. Schettino was in command of Costa Concordia on the night of January 13, 2012, when it struck rocks and sank off the coast of Giglio Island in Italy. The prosecutor said Schettino also abandoned ship before everyone else was off. Thirty-two people died in the accident. Schettino is expected to file an appeal and request that he remain out of prison while it is pending. 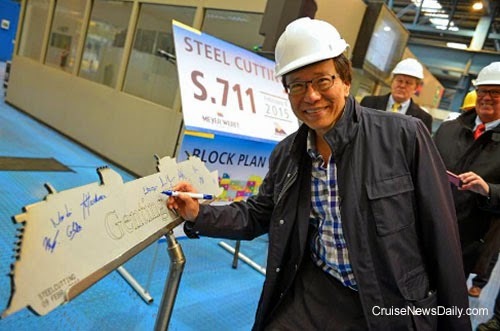 The complete story appeared in February 11 edition of Cruise News Daily. Yesterday we mentioned that in CLIA’s annual assessment of the cruise industry, they were excited that 70% of the sales were being made by travel agents, but we noted that only a few years ago, that number was typically more than 90%. Coincidentally, today Norwegian Cruise Line announced they were almost doubling their sales force in North America that works with travel agents. 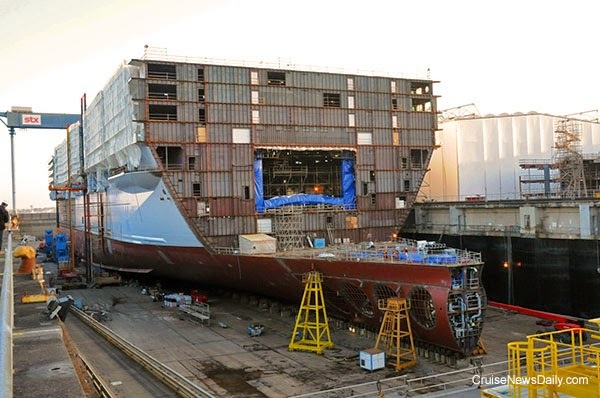 The third ship in Royal Caribbean's Oasis-class is beginning to take shape at the STX France yard in Saint-Nazaire, France. Here you can see blocks in place near the bow. Architectural elements inside the ship are also beginning to be installed. 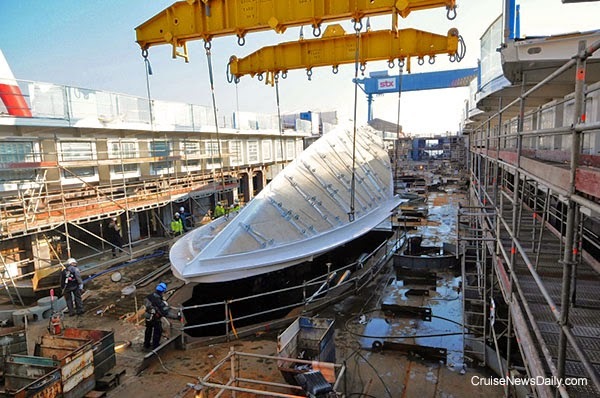 The keel was just laid in May, and delivery is scheduled for the spring of 2016. These photos were taken last Friday.